The original Intermittent Fasting Unique Weekly Schedule poster was here. But the site must have been taken down or expired. So, I made another Intermittent Fasting Unique Weekly Schedule poster that is printable for my Intermittent Fasting Women. I tried to make it similar to the original because I loved all the color and fonts. It would be a nice printable to hang somewhere as a reminder. This is a great schedule for weight loss. While I do recommend Bulletproof Coffee because it staves off hunger and makes you feel great, you can also make your own using coconut oil, ghee, and high end coffee. Wellness Mama has a great recipe here. This stuff really does tastes so good. And it gives your tummy that warm, full feeling. It also gives you a little extra *zing* to be creative an productive during your fasting window. I love how it begins with a 30-36 hour fast. That sort of makes the other days feel easy. I think I’ve read somewhere that switching between protocols like this can wreak havoc on your hormones. So, I would use this weekly schedule sparingly. There’s no way you wouldn’t drop weight very quickly. You would most likely experience benefits similar to a very long fast. 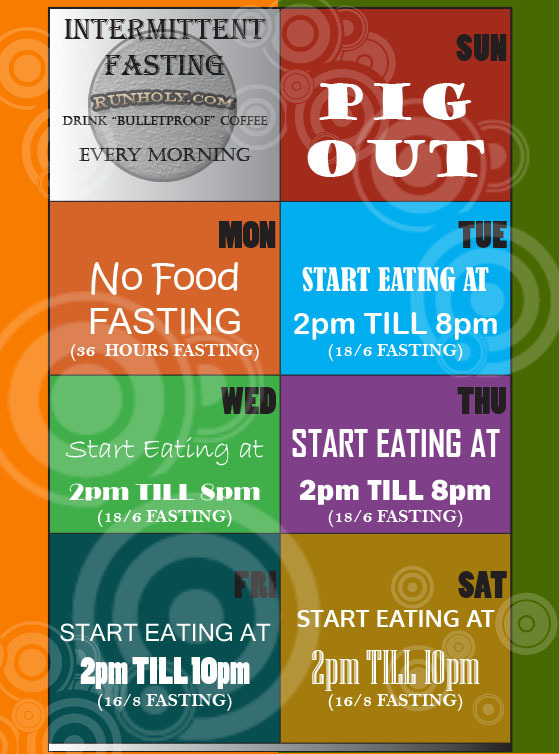 So here is the Intermittent Fasting Unique Weekly Schedule Poster… Just Right click and Save As. It’s 8 x 11. Leave your comments on whether this was helpful to you and what other types of posters for Intermittent Fasting would be helpful. Also be sure to check out my free printable Intermittent Fasting Fitness and Diet Planner!!!! This article on Intermittent Fasting mistakes was a good read so I thought I would share! Have an awesome day. Hi! I am trying to figure out if having bulletproof coffee is ok when I am supposed to be fasting. Is it OK or is water the only thing I should drink while in my fasting period? Are you a member of our IF Womens group on facebook? This question has come up a few times. I have heard both sides of the argument. Some women love it and say it helps them to fast more comfortably and doesnt affect their weight loss. Some women say that it stalls their weight loss. It does have a lot of calories. It’s worth a try for a week or two if you are struggling with fasting. It may make it easier, but I would watch the scale closely. No, I do not believe I am (yet). I just found your blog last night while researching about IF and have been wondering about BPC (I love it and feel like i NEED it to function so early in the morning) but I have also fasted before and know that a TRUE fast does not normally include such fatty yumminess! I guess the only way to find out is to give it a try! For me, coffee triggers hypoglycemia (& I don’t add any sugar; it’s the caffeine) so I can’t drink it if I’m fasting. I get that! Whatever works.